Look at the dates of these three quartets. Marx�s beloved Austria was tightly coiled in the murderous embrace of the Nazi regime. In 1938 Marx was removed from all his institutional posts and offices. This music operates as a statement of faith in traditional values although its endearing and warmly retrospective romanticism would have made the music acceptable to the Third Reich. Certainly all three achieved premieres in Graz and Vienna with prestigious ensembles. Those who are familiar with his irresistibly sumptuous orchestral music of the 1920s must prepare themselves for quartets that look back well into the mid-late nineteenth century. The style in the Modo Antico and Modo Classico is classical-romantic; more the former than the latter. There is none of the multi-tiered impressionism to be found in the Herbstsymphonie or the Naturtrilogie. The music radiates grace, sprightly virtues and well-turned elegance. Its heartland is clearly with Schubert and Mozart � lightly modernised. This latter element can be heard in the delightful finale of the Modo Classico work. This is gifted writing. The earliest work here, the Quartetto Chromatico was revised in 1948. Its language is more closely related to the Marx of the 1920s but also declares kinship with early Schoenberg and Karl Weigl. In the Sehr Langsam third movement Marx�s tenderest romantic inspiration is in constant efflorescence. A more carefree spirit pervades the finale yet the chromatic ascendancy is still there. The sound reminded me of John Foulds� string quartets (Intimo and Romantico). Things are looking up for Marx. The number of Marx CDs in the catalogue is not great but it�s a transformational improvement on the position only ten years ago. This is the second CD with this programme. The other is ASV CD DCA 1073 which gave world premiere recordings by the Lyric Quartet in 2000. The CPO engineers placed their microphones that much closer to the ensemble so we get a more intense and vital engagement with the players and their ardour. There is also the occasional rhythmic low thud well down in the sound-picture which perhaps suggests a tapping foot. If you enjoy that close-up engagement and appreciate a less expansive approach to Marx then the CPO is for you. Otherwise the more concert-natural and slightly distanced ASV disc is to be preferred. In the Classico the Thomas Christian Ensemble are about two minutes faster overall. For the other works there are only seconds of a difference between ASV and CPO. The Classico and the Antiquo found their way into orchestral form and those versions can be had on ASV (see review). Berkant Haydin, founder and General Secretary of the Josef Marx Society and the architect of the Marx revival is our reliable and inspired guide in the extensive booklet notes. Do not miss his website. 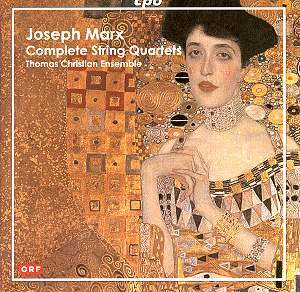 Vital, ardent, close-quarters playing and recording of these variously retrospective and romantic quartets.